In order to keep related data and graphs in the same location, sometimes we may want to embed a graph to display the results of an analysis next to the original data. In this post we’ll learn how to merge embedded graphs generated by Origin, as well as how to embed graphs within worksheets and as their own worksheets. You can follow along with this post by downloading this OPJ. Here we have some modified data from a tutorial, which we’ll run through a linear fit, generating the result sheet seen below. As you may know, every time we run a set of data through an analysis, it create an output sheet with the results and residuals of said analysis. In this case you can see our result sheet has created a scatter-plot of our data with a fitted line, as well as a multi-panel graph of residual plots. 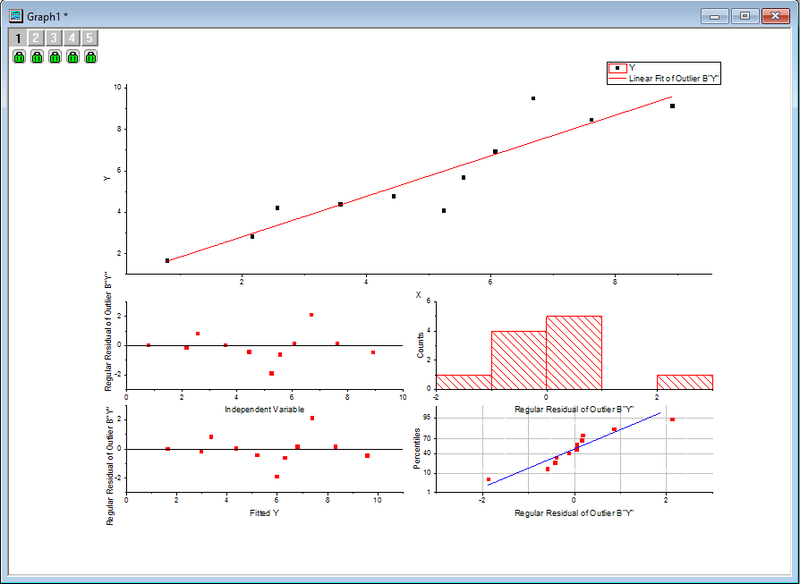 If we want to merge these two linear fit graphs, all we need to do is go to Edit>Merge (Embedded) Graphs. In this dialog we’ll set the merge setting to Active Page, our number of rows to 2, our number of columns to 1, and check off the Treat Each Source Graph as a Unit tickbox. 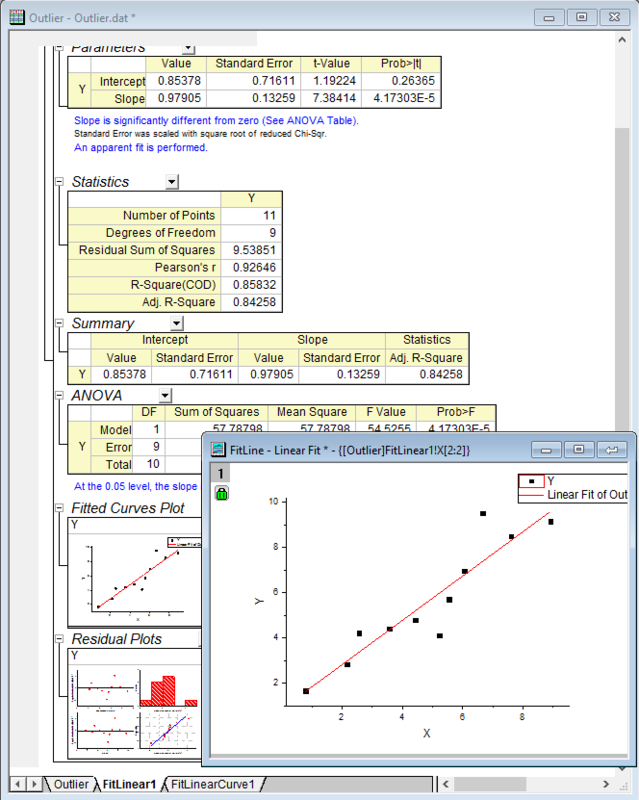 This will allow us to add the multi-axis residuals plot as a single object rather than the four separate plots. To make our label fonts a consistent size, under Scale Elements set the Scale Mode to a Fixed Factor of 0.4. As you can see, the resulting merged graph is a nice organized array that clearly shows our data as well as the residual plots associated with our linear fit. Let’s say we want to embed this new graph with our original data, to do this, we’ll go back to our original worksheet, right click on the grey area to the right of our cells and select “Add Graph…”. After doing this we should see something similar to the below screenshot. 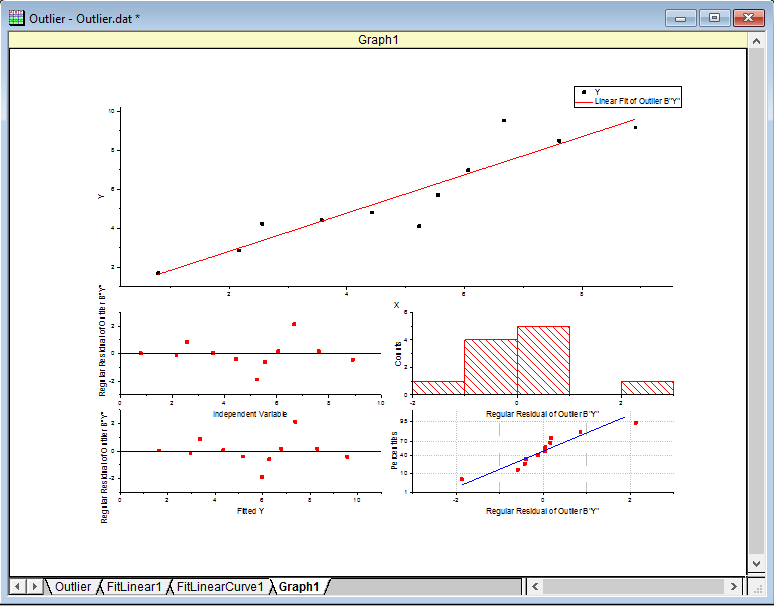 Double clicking on this graph will bring it up in a separate window temporarily, however there will be a return arrow in place of a closing button (X), indicating that when the graph window is “closed”, it is actually returned to the sheet in your workbook. 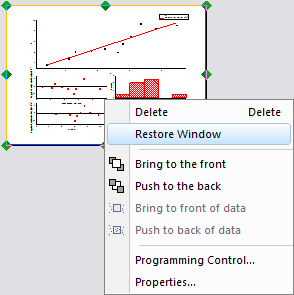 To restore our graph and separate it from the worksheet, we can right-click on the graph and select “Restore Window”, bringing our graph back into a separate window and restoring it to the Project Explorer window. 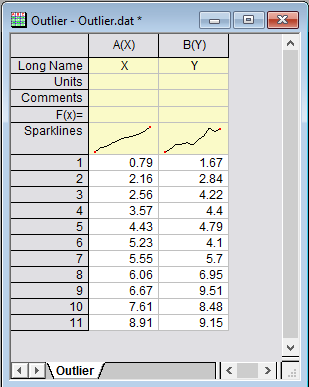 Graphs can also be embedded in workbooks as entire sheets. 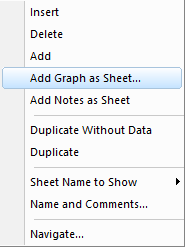 We can do this by right-clicking on one sheet tabs and selecting “Add Graph as Sheet”. 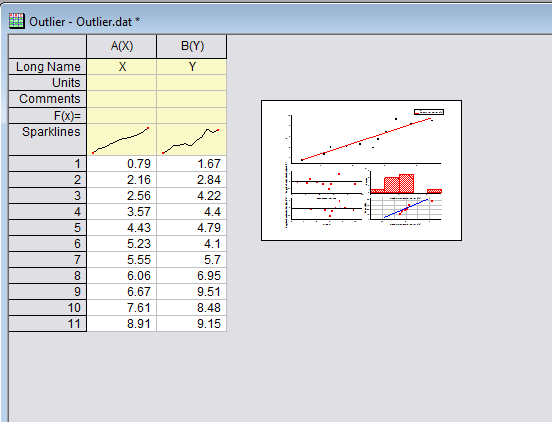 This creates a sheet with a 1×1 table containing our graph. 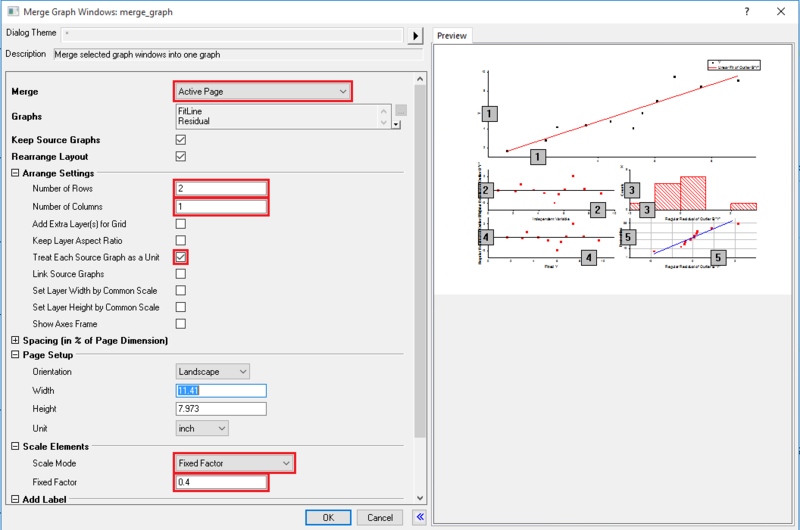 This graph can be handled the same way as an embedded graph, it can be restored in a separate window by double clicking on it, and it can also be restored as a separate graph in the Project Explorer by right-clicking on it and selecting Restore Window. Let’s say we want to export these graphs, the export dialog, with 15 native image formats, could comprise an entire blog post in itself, but we’ll cover it in brief here. If we want to only export one of the embedded/added graphs, all we have to do is double click to expand the graph, and then export it by either selecting File>Export Graphs or by right clicking on the title bar and selecting the Export Graphs context menu. For the purpose of this blog, we’ll set our image type to one of the most straightforward and widely used formats, .PNG. To preview our graph, check Auto Preview. Initially our previewed graph may appear as a blank page, but this is due to the sheer size of the default output (300 dpi) and the fact that the preview displays at Actual Size. If we want to export our graph to display on default monitors or on a webpage, we’ll need to set this DPI to something much lower like 72 dpi.